GC Super Monkey Ball (USA) "Expert through Master" in 13:10.78 by byrz, diddykong14, keylie & Barhunga. 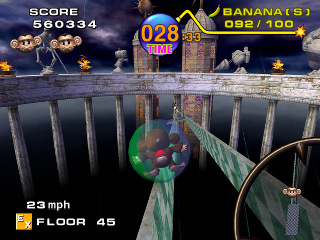 Sega's Super Monkey Ball lets you take control of one of four monkeys trapped inside a transparent ball. You must complete each stage by tilting the game level to roll your monkey forward or backward. There are 100 stages ranging in difficulty from easy to near impossible. In this TAS, the authors skip all the easy levels and warp to the Expert stages, where they proceed to tear through all 50 levels as well as the 10 Master stages, breaking many of the heavily optimized console world record times. Note: The encodes are currently missing music.